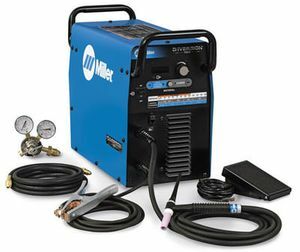 The Miller® Diversion™ 180 is a 180 amp AC/DC TIG welder that is capable of TIG welding aluminum. The Diversion 180 comes complete with TIG torch and remote amperage foot control, along with flowgauge, gas hose and ground cable with clamp. It is a great upgrade for the DIY welder and can be used on both 115V and 230V input power. 3. Set material thickness range, then weld! It's as easy as 1, 2, 3. Inverter-based, AC/DC power source provides a more consistent welding arc while using less power. Portable. Whether it's in the shop, garage or at the race track, at 50 lb they can be taken anywhere. Diversion™ 180 includes RFCS-RJ45 remote foot control and a multi-voltage plug (MVP™) which allows connection to 115 or 230 V receptacles without tools. Choose the plug that fits the receptacle and connect it to the power cord. Fan-On-Demand™ reduces noise and maintenance by lessening the amount of airborne contaminants pulled through the machine, while sufficiently cooling thermally protected internal components. Portable. Whether it's in the shop, garage or at the race track, at 50 lb they can be taken anywhere. PLUS get a $300 Build With Blue™ Cash Rebate from Miller® with the purchase of a Diversion™ 180 TIG welder AND get up to an additional $200 Cash Rebate when you purchase qualifying Miller® or Hobart® branded accessories (excludes welders and plasma cutters). Download Build With Blue™ Rebate Submission Instructions HERE. All rebate forms MUST be submitted electronically to Miller no later than July 15, 2019. Offer expires 6/30/19. Protect the finish and value of your Diversion™ 165 or Diversion™ 180 TIG welder with a Protective Cover from Miller. Miller's® premium grade goatskin TIG welding gloves, Size M, are designed for unprecedented comfort and performance. Genuine Miller® RCCS-RJ remote contactor and current control for your Hobart EZ-TIG™ 165i or Miller Diversion® 165 & 180 TIG welders. Choose inert shielding gas and CO2 cylinders for your MIG welder or TIG welder. Select Oxygen or Acetylene cylinders for your portable welding, cutting or brazing equipment. Is the miller diversion 180 completely made in the USA? Miller advises that the longest tig torch available for a Miller Diversion 180 TIG Welder 907627 would be 12 1/2 foot. Do i need to buy the aluminum spool gun to weld aluminum with this machine? Miller Diversion 180 TIG Welder 907627 can tig weld aluminum, you can not put a spoolgun on it. The Cyberweld price of $2,139.00 is before the Miller Build with Blue $500 rebate. So once you file your rebate you will have paid $1,639.00. You do not have to purchase any additional items. What are the maximum number of amps drawn during a High Frequency start? I have a 30-Amp breaker in my panel. You should not have any problem running this machine with a HF start on a 30 amp breaker. The highest amperage pull you should experience is 27 amps. is there a current rebate for this unit? Yes, there is currently a rebate of $200 on this machine. The rebate expires on 6/30/2017. Are the stinger and ground for this machine removable? The picture to me looks like no they are not. The torch and the ground on the Miller Diversion 180 TIG Welder 907627 and connected internally and are not removable. Could I weld a aluminium rim with this? The Miller Diversion 180 TIG Welder 907627 is rated as follows On 115 volts.It is has a 100% duty cycle at 60 amps and 35% duty cycle at 125 amps.. On 230 volts it is has a 100% duty cycle at 60 amps , a 20% duty cycle at 150 amps and a10% duty cycle at 180 amps. In order to participate in the rebate you will need to purchase the Miller Diversion 180 TIG Welder 907627 for the price of $1848.00. On the same order you will need to purchase an additional $250.00 of Miller family (Miller, Hobart, Smith, Weldcraft, Bernard) accessories. These items can be anything, for example welding helmets, carts, gloves, tig torches, oxy acetylene torches, even another machine . Anything in the Miller family but you must meet the $250.00 level. You will receive a rebate form with your order.Complete the form and send it and a copy of your order receipt to Miller and they will send you a check for $250 dollars.. Basically in the end you would be getting the accessories for free. The wording used for the Miller rebate program is somewhat confusing. Basically in order to participate in the rebate you will need to purchase the Miller Diversion 180 TIG Welder 907627 for the price of $1848.00. On the same order you will need to purchase an additional $250.00 of Miller family (Miller, Hobart, Smith, Weldcraft, Bernard) accessories. These items can be anything, for example welding helmets, carts, gloves, tig torches, oxy acetylene torches, even another machine . Anything in the Miller family but you must meet the $250.00 level. You will receive a rebate form with your order.Complete the form and send it and a copy of your order receipt to Miller and they will send you a check for $250 dollars.. Basically in the end you would be getting the accessories for free. Regarding your helmet purchase if you purchased a qualifying helmet after September 1, 2014 you would be eligible for the rebate.. Hopefully you retained your receipt. Lets us know and we can send you a helmet rebate form. Is this welder not good, good, or excellent at welding 20-24 gauge stainless steel. If not excellent, what Miller welder is? The Miller Diversion 180 TIG Welder 907627 is a entry level/ hobbyist / small shop tig welder.It provides amperage control down to 10 amps. This is enough control for 20-24 gauge stainless. With the correct size and type of tungsten it would be a good welder for this application. do you have the diversion 180 110V/240v with finger tip control on the tig? No.. Miller longer manufactures the Miller Diversion 180 TIG Welder 907627 with the tig torch with the built in finger tip control..The Miller RCCS-RJ Remote Fingertip Control 770669 is available as an accessory to provide finger tip control if needed. I have 208v Single Phase Power available in my shop. Can I run this Diversion 180 machine on 208 voltage? Please explain the rebate offer from Miller just a little bit more. Does it mean that If I buy the Diversion 180 at $1832 also buy the cart at $179 and the protective cover at $50 on the same ticket from you---does this mean I'm going to get a 10% rebate certificate for the amount of $210.06 that I can send to Miller & get a check in that amount?? Assuming all this is done before the 3/31/14 cutoff date. Also, is there tax added to my bill living & shipped to my AL residence?? I just ordered and received this machine. I ordered it based on the Specs and description in the current 2013 Miller catalog. All is good, however the Miller catalog claims all Diversion models come with a start-up video. I didn't receive that, and also the Diversion model is supposed to come with a Weldcraft LS17 torch with finger controls. I didn't receive that either. This was packaged with a std Weldcraft torch w/o finger controls. Not too bummed about the video, but one of the reasons for my selecting this model was the torch with built in finger controls...... So, my question is why was my Diversion 180 packaged and sent with different/missing items than Miller claims it comes with?? Can I use the Spoolmate 100 with the Diversion 180? Miller Diversion 180 TIG Welder 907627 is a tig machine, you can not put a spoolgun on it. 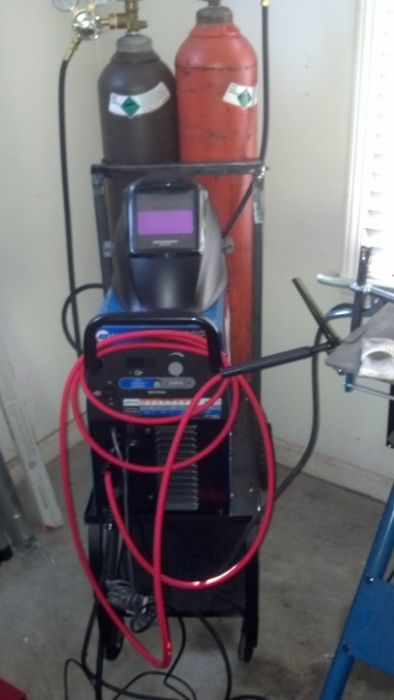 Whats the best Made in America Tig welder for my home shop auto restorations needs? 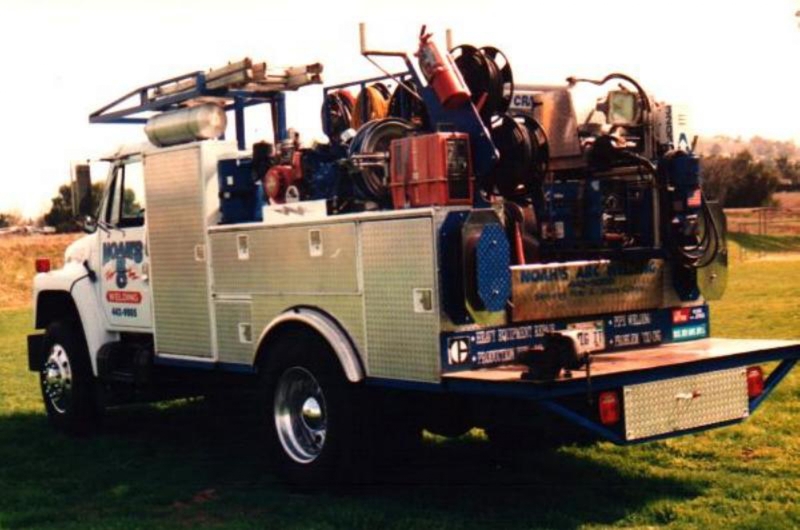 Which include: Welding thin steel body panels, typically 12 to 19 ga Steel attachments & brackets made from plate not thicker than 1/4" Welding aluminum tubing, and aluminum sheet up 3/16" thick Piecing together stainless tubing headers and exhaust Are all Miller Welders Made in America or only certain models? Is the Miller Diversion 180 compatible with the Miller Running gear 770187? Since I plan on using in my unheated garage, what is the recommended minimum operating temperature? When using the foot pedal does it go from zero to ful amperage or, from zero to max depending on where the amperage dial is set? What size collet comes with the tig tourch.? So I can order tungston size. The tig torch used with the Miller Diversion 180 TIG Welder 907460 is specific to this machine and cannot be replaced by a water cooled torch. What is involved to swap from welding steel to aluminum with this machine? I assume you would need different shielding gas. Does it have multiple regulator inputs? is this product 100 % american made? 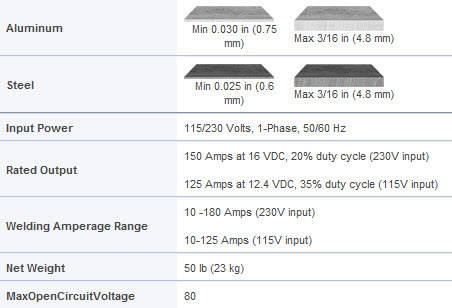 What is the reccomended input amperage for the diversion 165 and 180? What is the maximum recommended thickness of aluminum that this machine can weld, single pass? Will this welder also stick weld? Thank you. The Miller Diversion 180 TIG Welder 907460 does not have a stick weld option. Will this machine weld copper to copper? I am told you need a different cup to do aluminum work and miller recommends the "torch accessory kit", but I can't find any listing for them. Do you carry them? The description says it comes with a foot control, but there is no foot control pictured. Which is correct? Yes, the Diversion 180 does come with a foot control. Thanks for the heads up on the photo. We were using an older version. The new image with the foot pedal is now on Cyberweld. I was up and welding within an hour of opening the box. I've welded bronze and steel several times now and wonder why it took so long to buy it. Very pleased. ProsFast and easy set up. Even a novice knucklehead like me can weld like I know what I'm doing. something that he will be able to use for a long time and helps him to work on his welding skills at home. ProsMy grandson would have to let you know, but he did say this was the best machine. Bought my 180 for a portable machine to use in the field fabrication for my freelance business. So far I'm pretty impressed with this machine. Having only used it on 110, and not on 220 yet, this machine turns out great easy welds on steel to ; aluminum is a breeze, but maxed out on 110, it's a bit tough on T joints on aluminum. Thin sheet metal is a walk in the park. One thing I wish it had is detachable leads!! I know there is a kit out there for that, but there goes your warranty. As for Cyberweld, you have great customer service, and I appreciated the call to verify my credit card purchase. ConsNo detachable leads for a portable machine. 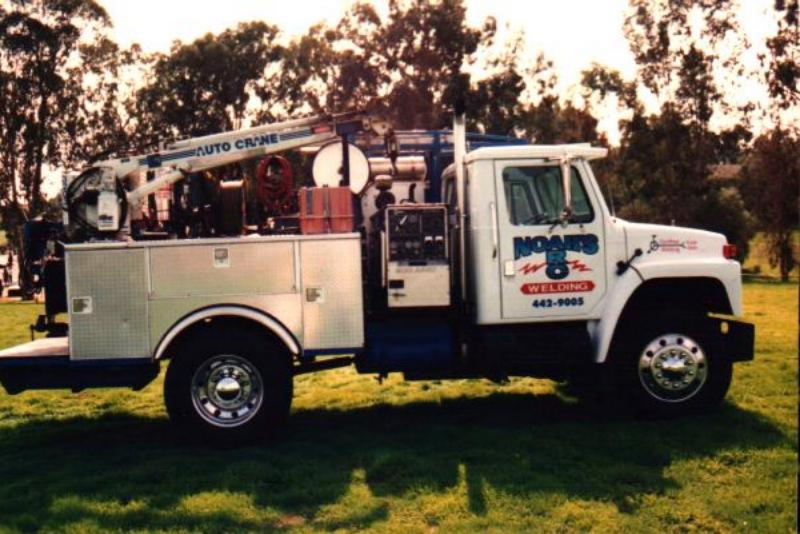 I couldn't ask for a better service and a phone call question was dealt with in a friendly and efficient manner. The overall performance of the welder is awesome. Handles each task with ease. I have had a Miller 215 mig with a spool gun for many years now, great machine, always wanted to try a tig. So I purchase a made in China tig, didn't work they replaced it second one didn't work either they were going to send me a third one I told them no thank's I was going blue. Good move, this Miller Diversion 180 is a good little welder. I bought it to weld up custom stainless steel exhaust systems small aluminum projects on Hot Rods. ProsSmall size big on performance. ConsNone for the kind of work I do. Had my own welding business in San Diego for 16 years but it's been 20+ years since I've TIGed any aluminum and I got to say this little welder did a great job. I've always been a big fan of Miller and inverters. This is Lamonster and Noah's Arc Welding approved. ProsLight weight. Easy starts. Did everything I bought it for. ConsWish I could reverse the polarity to ball the tungsten. DCEP Not a deal breaker. Very pleased with this welder, couldn't ask for anything more, at a good price. Welds aluminum great high frequency start is really good.I have a old miller dial arc and the high frequency is touchy. So far I really like the Diversion I go to it first now. ProsVery good easy to set machine. Welding for 50 years just retired. This welder is perfect for my hobby needs. Simple and easy to use. The best TIG I have ever used. I guess I had only had the opportunity to weld on older models at my work in the past. I took an aluminum tig welding class this summer in Indianapolis and they had this Diversion 180 for me to use. I have a Lincoln presicion tig 225 that I have struggled with trying to weld aluminum. I took the class trying to better my skills. This tig welder blew me away of how well it did on my aluminum class projects! I was better than what I thought when I started using this in class! I was so impressed I replaced my Lincoln with this Miller and never looked back!! Awesome for aluminum and stainless steels!!! Very highly recommended!!!!!! ProsEverything about it!! You will not be disappointed at all and Cyberweld is a great place for your welding needs!! 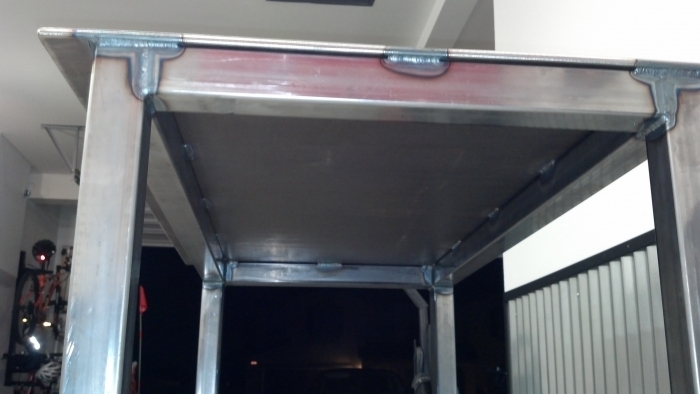 Just powered up and welded .050 aluminum sheet. Then had to do some stainless repair. If you are learning TIG and want a real welder, I can't think of a better unit. Highly recommend this welder. ProsCyberweld delivered in 2 days. Powered right up. No fuss. Went right to work. Ordered this welder for some aluminum projects and it's already paid for itself. Great quality at a great price. The shipping time was extremely fast as well. Cyberweld will definitely be getting my business in the future. Awesome welder, especially for a beginner like myself!! Fast shipping and great product, win win! Have used this to weld both steel and aluminum so far with no complaints. Relatively straight-forward machine, easy for beginners to learn TIG. ProsEasy to use, ready to go out of the box. Decent regulator, and all other included components. The Miller Diversion 180 is a great machine that is well worth the money. A great choice for the fabricator and hobbyist. Easy to set up, very to use. The machine does lack some of the features offered by the higher end Miller models but it is still a good machine to start with. I have been using the Diversion for about a month and I am not disappointed. The multi-voltage plug is very handy. Glad I saved the extra money for a machine made in the USA with a warranty! As for Cyberweld, they have certainly met my expectations. Fast shipping, good prices, good selection of equipment. I look forward to doing business with them again in the future. ConsNo pre/post flow adjustment Torch lead is a hard connection to machine. after hours and hours of being online reading and watching reviews I settled on this machine, this is the first TIG i have ever owned/used, I obviously need a lot of practice, but so far my welds keep getting better and better every time I use it. I'm a hobbyist and needed a good TIG welder for some projects. The Diversion 180 fits the bill. None of this fancy stuff that I need to learn, just straight forward, no frills welder. Ordered from Cyberweld, saved a few hundred off the local store, and got it delivered in a couple days. Could not be happier. Could not be happier. The purchase, the shipping, the speed in which it arrived. First tig machine and very pleased with it. Super fast delivery, and great price! Wow, I ordered my TIG welder Monday afternoon, and it's already here on Wednesday morning. That's super fast, and also several hundred dollars cheaper than the welding stores in my area. Thanks Cyberweld! You can expect more orders from me. Worked great as described on website. . Arrived in perfect shape. Got a bottle of argon and began to practice. Confident enough to weld garden gate by end of afternoon. My first purchase from CyberWeld, but definitely not my last. Superb service - shipping was fast and the product arrived in perfect condition. Bought this for a hobby machine, and love the dual voltage feature. I'm not worried about duty cycle at high amps, since I'm mainly doing sheet metal work. This 'entry level' TIG machine is easy to set up, comes with everything but the bottle, and should last me for the rest of my life. Nothing but good things to say about the machine, and CyberWeld. ProsEasy to set up. Complete system (less bottle). Easy to understand instructions. Very little assembly required. Made in USA. ConsI didn't buy one sooner. Great for small home shop projects. I bought this welder to use at home. I was tired of driving into work on the weekends for small home welding projects. I have used it to fix motorcycle engine cases and yamaha yz85 extended swingarms and it works great? I have only used the 115v plug. I have welded 6061 T6 up to 5mm thick and 50mm long with no issues. I tried one long bead at 300mm long. The fan stayed on a little longer then normal, so I think that is the limit before it would shut down from before over heating. ProsFast and easy set up. ConsPower cord needs to be longer! Excellent prices and superb delivery time. I have not had the opportunity to use this TIG unit yet, but it's a Miller and I've no worries about it performing as advertised. Helped my 19 year old son purchase this and he loves it! Was delivered when promised in perfect condition. Thank you! I placed my order and a couple of days later my new welder arrived. I've used it only once so far and it worked perfectly. ConsI felt a little misleading on the Miller $250 rebate. After reviewing what is required to obtain the "rebate" it's difficult for me after spending $1,848 to justify another $250. Easy to use, the high frequency start with the foot pedal works like a dream, plenty of power even with the 110 plug. I'm very much a beginner though I've taken several TIG welding classes. I use the Diversion 180 only for aluminum, mostly 1/8" and it's done everything I ask. It's much easier to use than the 350A Lincoln transformer rig I learned on. I have much better puddle control. It has shut down on me a few times while running really long beads, but no drama. Just wait a few minutes for it to cool down, step on the pedal, and back to work. If you are a pro or need a bigger machine, then it's probably not for you. But as hobbyist I would most likely just misuse the extra features of a Dynasty. ProsEverything I need, but no more. ConsIt would be nice if Miller made some additional Multi Voltage Plugs. I have to use a home made adapter to connect the NEMA 10-50 MVP to my NEMA 14-50 outlet. This is my 2nd TIG welder and I couldn't be more impressed with the ease of use. I went back and forth trying to decide on a model that had a dozen different set up controls and the Diversion 180 with a no-brainer approach. When I realized I'm bad about taking the time to actually do a full set up, I knew this was the welder for me--why complicate things? The foot control and High-Frequency arc start are a must. I learned to weld in high school, and I took two years of gas welding. I own a stick welder, but I'm terrible at it. This Miller 180 is like magic. I was a pretty good gas welder, but this tig welder is so much better, it's incredible. My first project was welding dissimilar metals with different thicknesses. I used different tig rods, and everything worked perfect. The foot control is the cats meow, I love it. I bought a Miller welding helmet that automatically darkens when I start my welds, and it's magic too. The high frequency starts is incredible, it will send an electrical arc an inch or two if you press the pedal to the floor. Seriously, this will do anything it seems. They should have made it clearer that the torch only comes with a single size tip. You need to purchase all the sizes available so you can use the full potential of this machine. The torch, foot pedal, and welder is a perfect match. I love it. Cyberweld has the best internet price, can't beat free shipping. D180, great tig machine. Love the 110 function. My old 220 sucked the power. I bought this because my 220 Miller machine was blowing the breaker on 1/4 inch aluminum. This machine welded it with only 110. I would recommend this unit. Not so happy with the finger controls. Pros110 and 220. Very easy to use. Comes with everything. Product shipped immediately. I love it. Easy set up. I'm new with this type of welding so it takes a little practice. But enjoying it! Over all a great machine. ProsOperation as I expected, flawless. Hope it last for years. Used with a generator 220 volts no problems. ConsOnly one thing working at 120 amps the torch will get pretty warm, had to take a breather. Also you will need a 30 amp breaker at 110 volts @120 amps, longer than 10 minutes. Ive had this welder for 2 years and its done everything I've needed it to do, for thick aluminum I just added helium and got smooth clean welds. As far as the torch and hose goes I've replaced with a more flexible hose and smaller torch from HTP. I've also changed out the foot pedal to a larger one with a lot more range for better arc control. May try a water cooler just for the fun of it. Great price...fast delivery...welder works great! Thanks for an excellent purchasing experience. 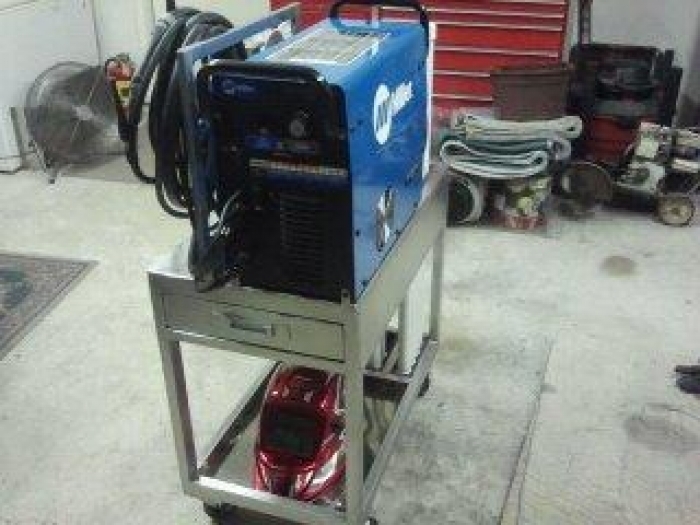 This is a great addition to our shop and now gives us the ability to do high quality TIG welding in house. 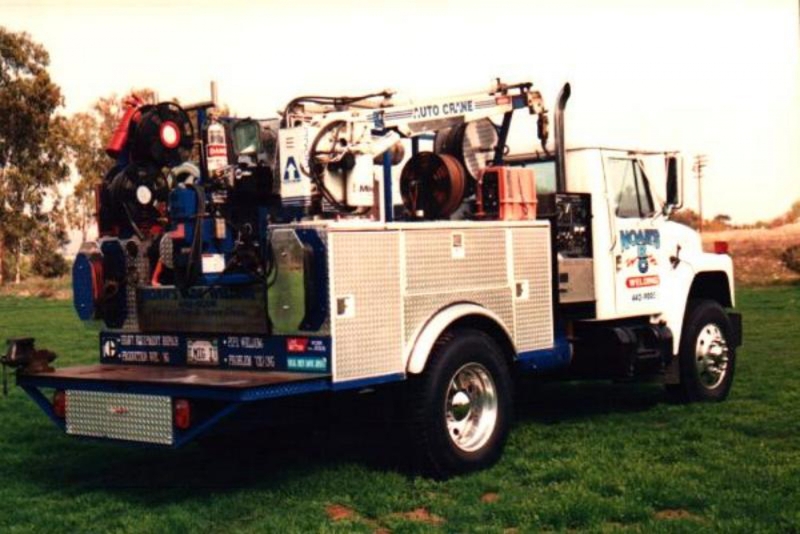 Our workhorse welder is a Miller 250 MIG to which we added a spoolgun for copper and aluminum welding. ProsEasy to use, perfect for home / shop use, small does not take up a ton of space. easy set up. I haven't welded in over 10 years. Was more of a stick and MIG welder when I did weld. I learned TIG enough to have great respect for it. 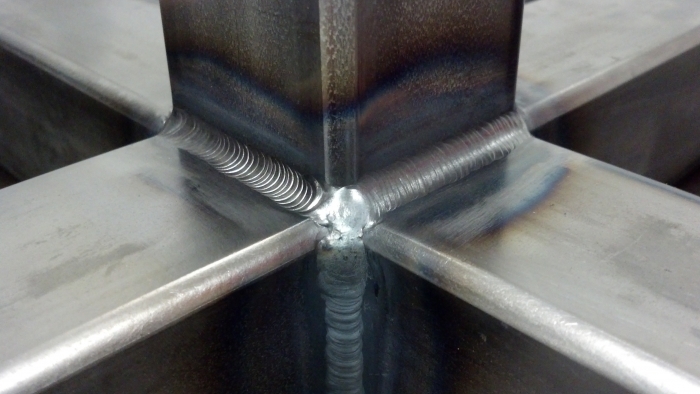 Within a few tries I was producing beautiful well penetrated welds on .125"+ mild steel and stainless steel. Thin material is giving me real trouble but I suspect that is because I was a structural welder and rarely attempted thin material. I have very little experience with Aluminum. It is a strange animal and is also giving me real trouble. It is like it doesn't want to form a puddle until it is ready to completely disintegrate. ProsIt is easy to use and set-up. There are not any settings that I am unsure of. I know when the machine is set-up and I need to quit messing with the controls and work on my welding. Conslow duty cycle The post gas flow setting seems to waste a lot of gas on my volume challenged bottle. I've got this one and a Miller Dynasty 200DX that costs about 3x as much. I still use this one more. The DX kills on aluminum, but the 180 does steel really nicely. Love the ergonomics on the torch, the foot pedal is great, and that it just uses an (easily replaceable) ethernet cable is awesome. Only complaint is that the postflow is too long. Other than that, it works really well. I always wanted to try TIG and this machine seemed like the way to go. Easy to use and certainly excellent for a beginner. I haven't tig welded in many years and I'm not a professional welder, but this welder has made it easy. 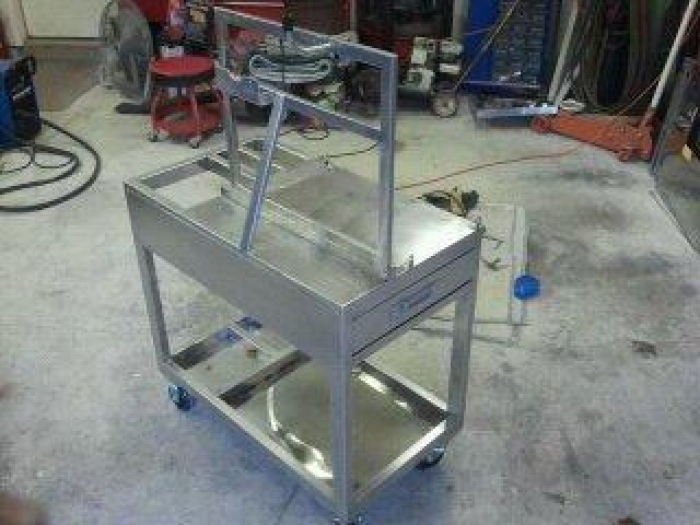 My welding cart was my first project. I was able to make it out of stainless steel thanks to the ability of the DIV 180 to weld so many different types of metal. I'm still trying to perfect my methods, but some of my welds looked professional and although I was getting better with practice, the welder made it easy to produce professional looking welds. I honestly think this would be the perfect welder for the money if they only would have put a flowmeter instead of a pressure regulator in the deal, especially since every spec I found related to flow and not pressure. ConsA pressure regulator is provided instead of a flow meter. I was looking for a GTAW for home / garage use. A friend on mine has the Dynasty 200 and was very impressed. I just did not want to fork out $4000 for a set up. After reviewing the Diversion 180 on multiple web sites an Youtube I decided to give it a shot. Wow I'm happy with the performance! I've had the unit for about 1 month now and completed 2 projects. A welding bench and a pedestal for my bench grinder. And even though Miller states 3/16" max on steel, I had no problem welding 1/2"
ConsNot being able to change to a different weld torch. 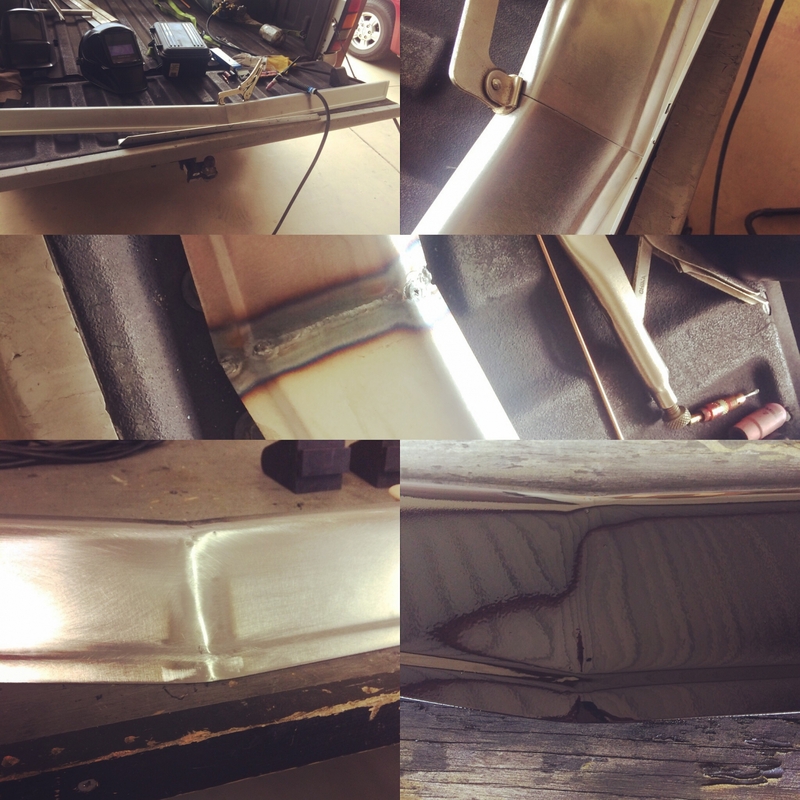 i do alot of side welding on aluminum on motorcycles and dog boxes and boats. it runs a very steady arc and smooth start and stops and the automatic cut off on the torch saves argon. it was well worth the buy. The only thing missing is a frequency adjustment for AC welding. For my fabrication work this welder works great. It does run on 110V, but its a bit doggie. Runs very well on 230V. Gas post flow is a bit long and there is no adjustment for that. The gas regulator could use a cfm gage, it only has a pressure gage. Ultimate personal use TIG machine. So far I've really liked this welder. Having used mostly MIGs, this is indeed my first and the purchase was well worth it. I've welded mostly Aluminum with it (4340 and cast parts). The steel stuff I had I've fusion welded it and have worked very well. 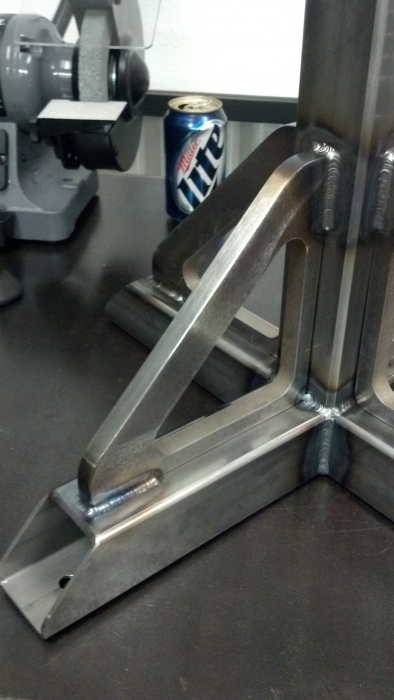 The weld quality turned out excellent (prep work has a lot to do with it also). For a personal/hobby use, you can't go wrong here. It is an AC/DC inverter welder and to guys who are used to traditional transformer TIGS may be blown away with what it can do with a 115V plug. My MIG is a MillerMatic Passport (also an Inverter based machine purchased here at Cyberweld) and after seeing how easily maneuverable the MIG was I knew the TIG I were to purchase would be a Miller Inveter machine. For half the cost of a Dynasty 200DX, the Diversion 180 is definitely not half the machine. ProsHalf the price of the Dynasty 200DX and isn't half the machine. Comes with foot and finger tip current control. The on-off finger switch has unique controls (refer to manual). 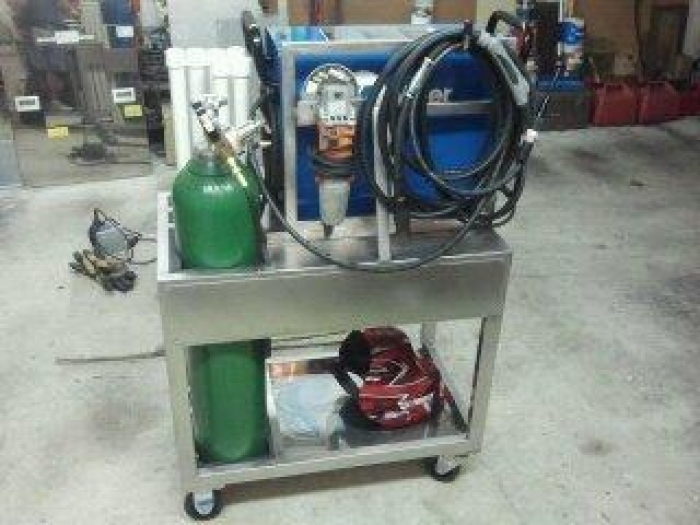 The machine is luggable, comes with cart plans and does AC welding. Settings that most beginners are not able to understand and adjust are fixed ( pre-flow,post-flow, positive/negative balance and frequency) and quick reference card in front allows you to setup the remaining parameters at a glance within seconds. Great welder for the money, sort of? I wanted a smaller maching comming down from a Miller Sycrowave 200 to the Diversion 180. It does work and does everthing it is suppost to do but I was'nt happy with it and have since sold it at a loss. I only used it less than 30 days. I will save my cash till the Dynasty series comes down a little in price. ProsSize and weight make it really portable. ConsI know price is a factor but "all" tig welder need adjustable frequency if your messing with aluminum. Great Welder, Great Shop, Great Experience! Every single forum I went to described purchasing this item as ither the bigest mistake you could get yourself into or not a good move. If you are into production (AKA welding every day for long periods of time) maybe this is not it. But if you are like me, I just don't see where you could go wrong. As of today, I have not even once hit the alleged duty cycle capping. The welder has performed under stress for all of my practice runs. I am glad I went with the 180 instead of the lower level as the added pedal and ability to use either 110 or 220VAC is one utter must! Buying from Cyberweld was also a pleasing experience. Item took a little bit longer than I anticipated but it was Christmas week, so what can I expect? Even with all the latencies associated with the season, I got my item in a very reasonable time. ConsCannot think of any dislike!